The problem you are facing is as follows. You are quite familiar with all the different flavors of Ubuntu, may their first letter be L, K, X, or vanilla U. Now, you also happen to love Steam, and ever since it was introduced to Linux at the beginning of the year, you have installed it multiple times in your various distros. But never Kubuntu. Now that you've tried that, too, you realize that Steam is simply missing in the official Kubuntu repositories. You cannot locate it any which way, and you realize that the only way to get it configured is the manual download and install. But we don't want that. We want updates through the repositories. 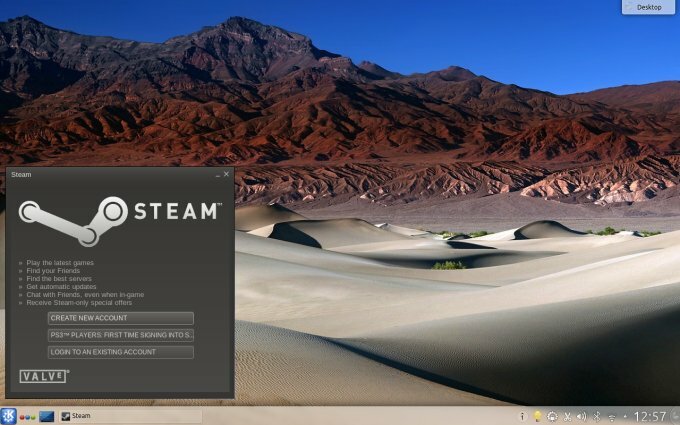 Anyhow, let me show you how you can quickly and easily get Steam running on Kubuntu. Try searching for Steam using the Muon package manager. You will get no successful results. At this point, if you're a little more versed in the ways of Ubuntu, you might be tempted to enable the Canonical partners repository in the sources. Please do that. Won't make a difference. Likewise, searching from the command line, using apt-cache also returns no results. It is as if Steam does not exist in Kubuntu, which is quite strange, because it works like a charm in both Ubuntu and Xubuntu. Right. Indeed, I had the same problem when testing Kubuntu 13.10 Saucy Salamander. Luckily for you, I've managed to find the right solution for your problem. The thing is, if you remember my official Ubuntu Steam guide, it would not let us install from the command line, either. 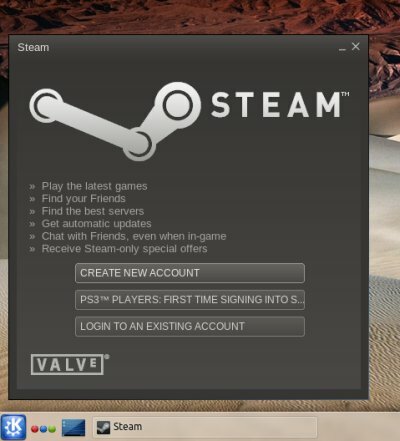 The reason is, Steam is offered as a buy item in the Ubuntu Software Center, even though it costs nothing, but you are still required to sign in using your Ubuntu account. Now, Muon does not properly support this authentication method, hence you do not see Steam in your Kubuntu repositories. Solution? 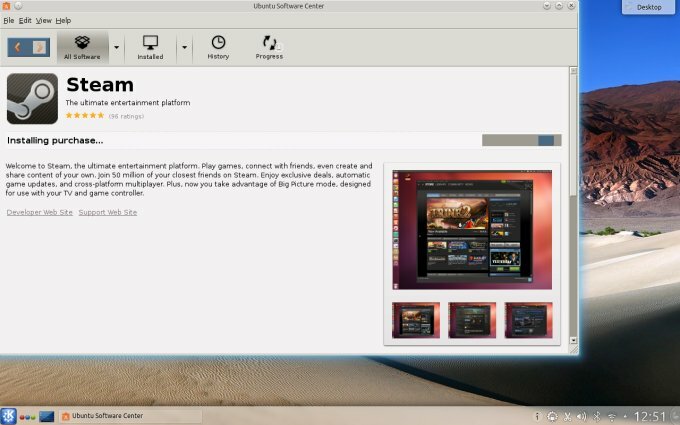 You can either opt for the manual configuration, or you can install the Ubuntu Software Center inside your Kubuntu. It's an ugly hack, but it will get the work done. Once you get the USC installed, fire it up. Notice the super ugly theme on top of KDE. But Steam is there, so we will install it. Now, if you had any doubts we're running inside Kubuntu, then there's a full desktop screenshot that demonstrates that. After you install the basic package, run Steam. It will download and install the additional 32-bit libraries it needs, and then it will pull any remaining updates. Once these two steps are completed, you can just normally login to your Steam account using their two-factor authentication method. There, job done, easy peasy. This can be done in Muon, under Settings > Edit Software Sources. The exact location of this entry might change a little based on which tool you launch. The Muon Software Center, Package Manager and Muon Discover are all slightly different from one another. So just browse the file menu, and look for the right line. It is rather odd and sad that you must resort to these kinds of methods to get an official package running on top of an official and supported Ubuntu flavor, but this is something that Canonical and friends will have to fix internally, otherwise it will become an ugly blemish on a white sheet of professionalism. I admire the use of the login and buy functionality to boost the overall look & feel of Ubuntu against the likes of Mac and Android, but it has to be seamless, otherwise it breaks and ruins the experience, and worse yet, creates inconsistency. This tutorial gives you a workaround for the fundamental shortcoming. And it's taught you a trick or two, mostly about how Ubuntu works, official repositories, Ubuntu login, manual repository management, and such. Decent stuff for a quick five minute read, especially if it solves your problem. Now, off you go. Gaming time.